Zinc is an essential mineral required for proper functioning of the various organs in the body. It is an essential trace element that benefits the digestive and immune systems, and has been used as an effective natural cold remedy for ages. It can also be used to control of diabetes, reduce stress levels, boost energy and metabolism, and to heal acne and wounds simply by eating zinc-rich fruits daily. Since zinc is inherently a metal and our body needs it in small amounts. It is important to take zinc in some quantity every day, because our body doesn’t store zinc. So, a daily zinc intake is recommended to perform important bodily functions like hormone production, growth, and repair, as well as to improve immunity and facilitate digestion. Zinc helps to produce testosterone in men, and its deficiency causes erectile dysfunction—one of the most common sexual problems in men. 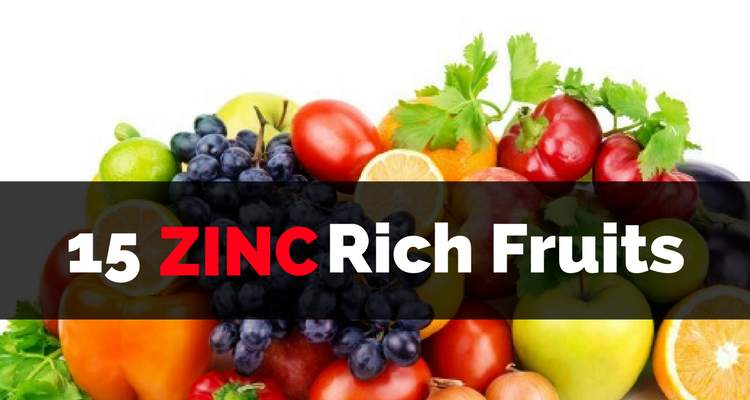 You can easily receive your daily recommended intake of zinc from eating these zinc-rich fruits. Fruits with zinc have anti-inflammatory and antioxidant properties that benefit the human body in amazing ways. It helps to prevent free-radical damage of cells, maintains hormonal balance, and decreases the risk of diabetes and impotence in men. Zinc is also known to treat skin conditions such as psoriasis, eczema, and acne. It also boosts hair health by providing a healthy texture, shine, and vitality. 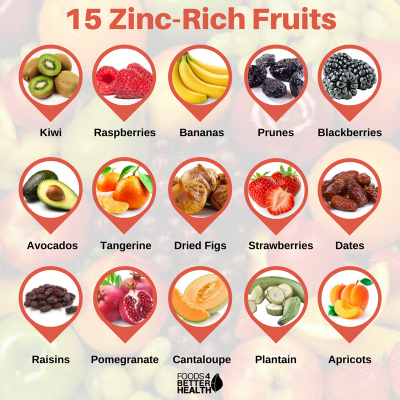 Here are 15 zinc-rich fruits that you can eat for your daily dosage of zinc. These “single-seeded berry” fruits are excellent sources of zinc. One cup of cubed avocado offers almost one milligram of zinc. You can add guacamole dip often to your lunch meals for a daily and healthy portion of zinc. They also contain a good amount of zinc, especially the dried variety. A cup of fresh apricot has 0.33 milligrams of zinc, while one cup of dried apricots contains almost half a milligram of zinc. One of the fruits that rich in zinc are prunes. A one-cup serving of these sweet-tasting, dried plums will provide you with 0.77 milligrams of zinc. A cup of fresh blackberries has .53 milligrams of zinc. You can have this zinc-rich fruit first thing in the morning with your daily bowl of cereal, or with a bowl of fresh yogurt. Another zinc-rich berry variant, raspberries also supply zinc in good amount. They offer .52 milligrams of zinc per a one-cup serving. Another one among zinc-rich fruits are raisins. These are dried, seedless grapes and provide .32 milligrams of zinc to your daily value. A high source of zinc, dates are another variety of dried zinc-rich fruit. Eating just three dates a day will provide .32 milligrams of zinc. Characteristically green in color with an exotic taste, kiwis are loaded with vitamins and minerals. One of the important minerals in kiwi is zinc. One cup of sliced kiwi will give your body about 0.25 milligrams of zinc. Widely popular for its health benefits and easy availability, bananas also contain some amount zinc along with potassium. A nine-inch banana will give as much as 0.23 milligrams of zinc. Attractively fragrant and tasty, strawberries also replenish zinc levels in the body. A one-cup serving of strawberries has 0.23 milligrams of zinc to offer. Belonging to the mulberry family, one cup of dried figs contains 0.82 milligrams of zinc. Juiced or canned, tangerines will provide 0.53 milligrams of zinc for every 100-gram serving. This brilliantly red-colored fruit contains o.35 milligrams of zinc per 100-gram serving in its raw, unprocessed form. A bowl of cooked plantain offers 0.12 milligrams of zinc per 100-gram serving. A variety of melon, raw cantaloupe contains 0.18 milligrams of zinc per a serving of 100 grams. Do Bananas Have Enough Zinc? Bananas may not be the best zinc-rich fruits out there, but they will contribute some amount of zinc to your diet. The nutritive values of banana include a 2% DV of zinc. According to the U.S. Department of Agriculture’s National Nutrient Database, a seven-inch banana contains about 0.18 milligrams of zinc, while a nine-inch banana contains a slightly higher amount of the mineral, only 0.23 milligrams. Studies reveal that average adult males should consume 11 milligrams of zinc per day, while adult females should consume eight milligrams of zinc per day. Additionally, a conceiving mother should aim for at least 11 milligrams per day, and those lactating should consume 12 milligrams of zinc per day. Although bananas can provide you with some zinc, it is not enough to meet the daily requirement. It is prudent to add other food sources of zinc. Zinc benefits skin and hair health tremendously. To help treat acne, 40 to 300 milligrams of zinc sulfate should be taken orally two or three times daily, with or without food, for four to 12 weeks. If the dosage is too much for your body, then try taking 30 to 200 milligrams of zinc gluconate prior to a meal daily for two to three months. Skin disorders like leishmaniasis and eczema can be treated orally with 2.5 to 10 milligrams of zinc sulfate per kilogram for 45 days. Zincomed can be used to curb hair loss and improve its quality. Containing 220 milligrams of zinc sulfate, it could be taken by mouth twice daily for three months. To treat dandruff, use shampoos containing one percent zinc pyrithione (ZPT). Zinc is present in small traces in most foods. Here’s a list of other zinc-rich foods that you can include in your daily meals for a regular supply of zinc. This is a good plant source of zinc. A serving of 100 grams of spinach will provide you with 0.53 milligrams of zinc containing 23 calories. Wheat germ is an excellent source of zinc. A serving of 100 grams of toasted wheat germ can provide you with 17 milligrams of zinc. Seeds are excellent sources of essential minerals and vitamins. Pumpkin seeds contain 10.3 milligrams of zinc per a serving of 100 grams. Another zinc-rich food, sesame seeds contain 10 milligrams of zinc per 100 grams. Edible mushrooms are highly nutritious as well. In addition to other important minerals, mushrooms contain 1.4 milligrams of zinc per 100 grams. Shellfish are rich in many minerals including zinc. Seafood like lobsters, clams, mussels, and crabs contain a good amount of the zinc mineral, too. A serving of six oysters will give you 76 milligrams of zinc. A healthy snack food, nuts are zinc-rich foods. For example, cashew nuts will give you about 5.6 milligrams of zinc per 100-gram serving. A piece of dark chocolate daily can improve your zinc level. A serving-size of 100 grams of dark chocolate contains 6.8 milligrams of zinc, about 45% Daily Value (DV). Zinc is an essential mineral that is required in traces. In some people, zinc ingestion may cause nausea, vomiting, diarrhea, metallic taste, kidney and stomach damage, and other mild side effects. It is recommended to take a 40-milligram daily dosage zinc orally. However, routine zinc supplements shouldn’t be taken without consulting a physician first.